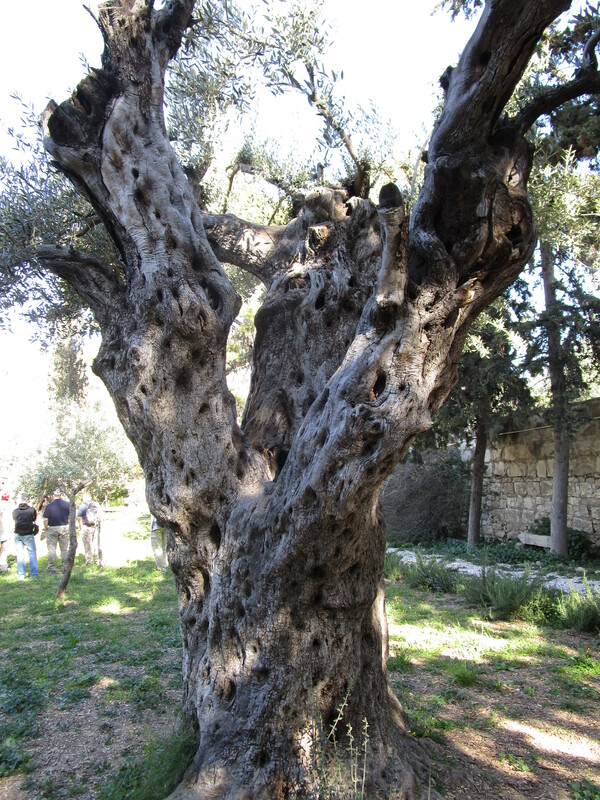 Walking in the places where Jesus walked has been a life-changing experience for me. But not exactly for the same reasons I expected. Before we left, I thought that I might somehow feel differently over here…that I might feel closer to Him, or see things through different eyes. I don’t have any explanation why I thought that…I just did. But this is what is making the difference: “I have stored up your word in my heart, that I might not sin against thee,” (Psalm 119:11). His word in my heart is powerful, and it is heart-changing and life-changing. 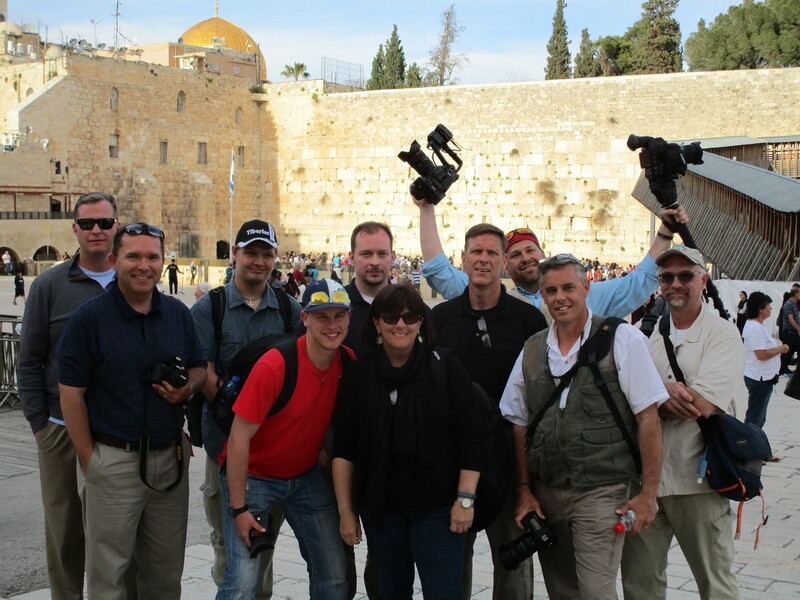 But I think many expect to come to Israel, Jerusalem in particular, and because they are closer geographically to the locations where He lived, they feel like they are in His presence. I am so very grateful that He is always with me: I do not have to travel thousands of miles or make a pilgrimage or tuck a prayer note into an ancient wall in order to be in His presence. Whether in green pastures, by still waters, or through the valley of the shadow of death – He is with me. WOW! Where do I even begin?? 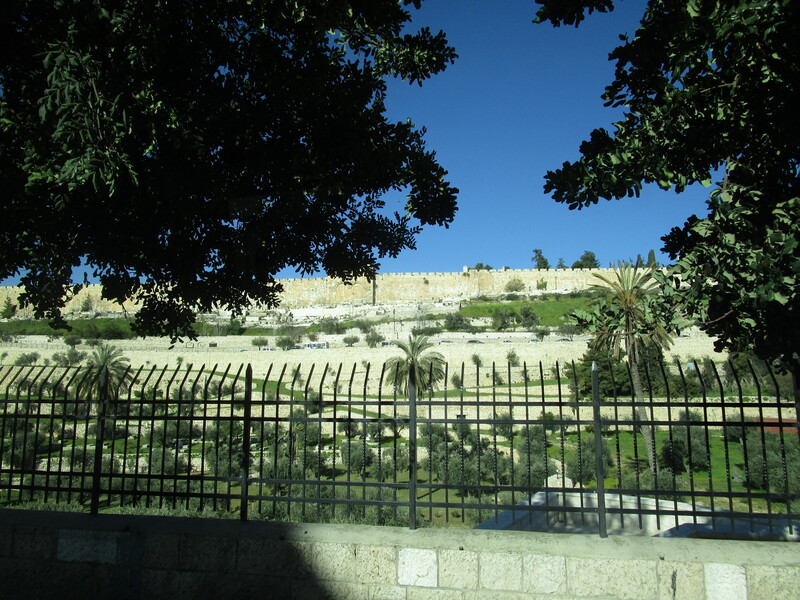 Jerusalem: an ancient city. It boggles my mind how old things are (have I already said that a few times?) We get excited at home about a coin or bullet or button found from 150 years ago – antiquities here are THOUSANDS of years old! The city has a population of about 800,000. Of those, about 62% are Jewish, 35% Muslim, and 2% Christian. It is built in the Judean hill country, surrounded by valleys and mountains, with steep hillsides dotted with large rocks and thorny bushes. The “new” city, outside the old city walls, is very modern (at least the side I’ve seen.) 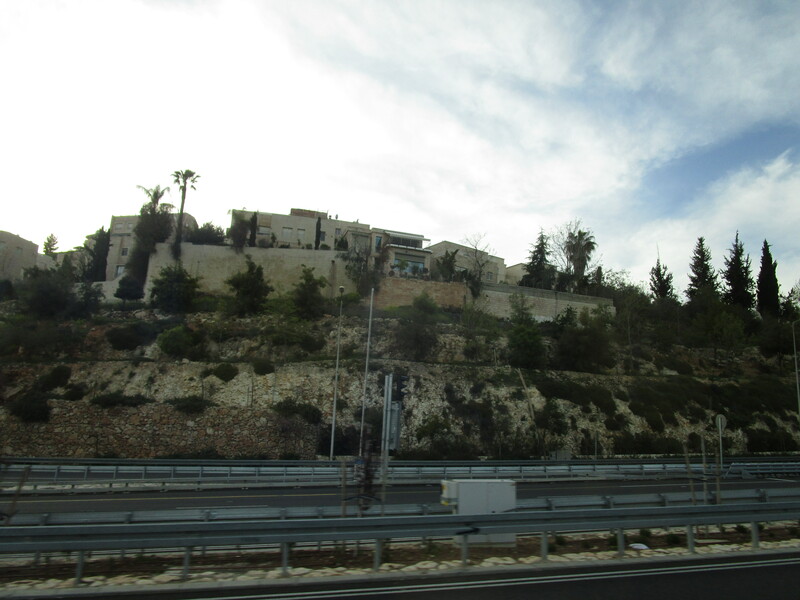 This morning as we left the hotel and drove toward the old city, I saw small children that looked to be about seven or eight walking alone to school in tidy uniforms. I saw white limestone apartment buildings similar to trendy west Austin neighborhoods, modern clothing boutiques, and then I saw older, narrower stone streets with little fast food restaurant kiosks attracting morning commuters. 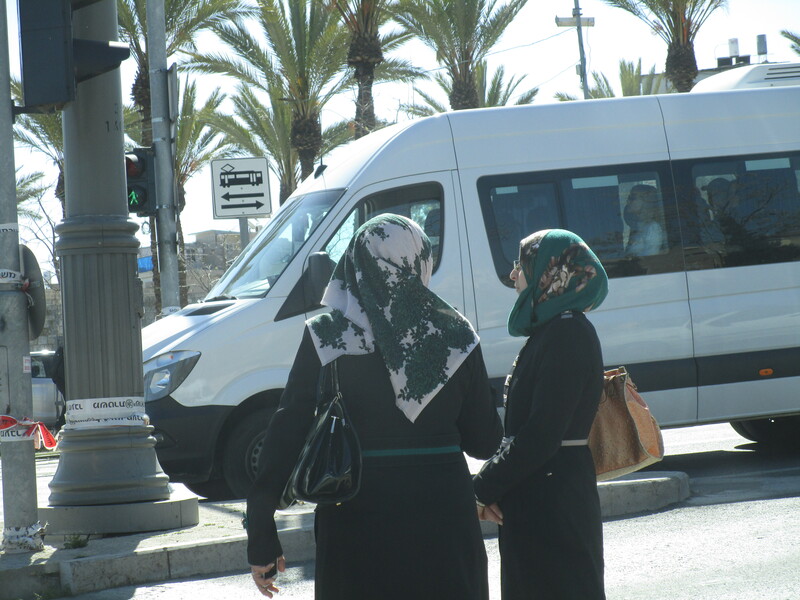 I saw men hurrying by in the tall black hats and long black coats of the ultra-orthodox, right next to Arabic women in white or black or colorful hijab coverings, all going about their business. 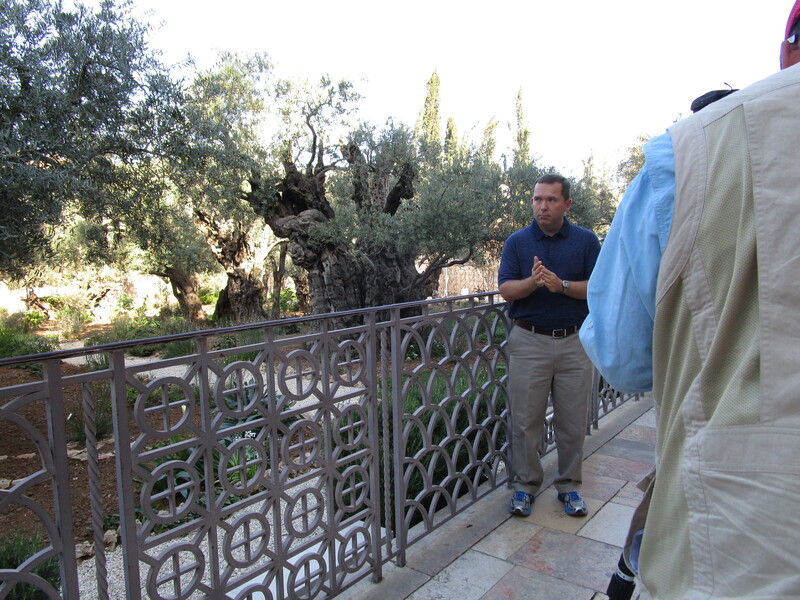 Jon filmed here as well, a segment about Jesus’ arrest, and the mockery of a trial He endured. 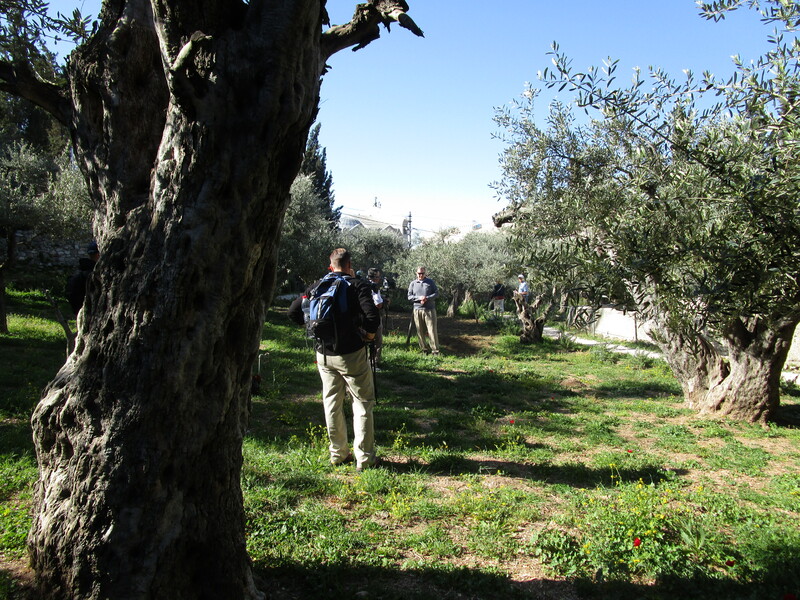 We then followed Tsvi around the corner to the “grotto” where some believe Jesus was arrested, and where Nicodemus met Jesus by night. 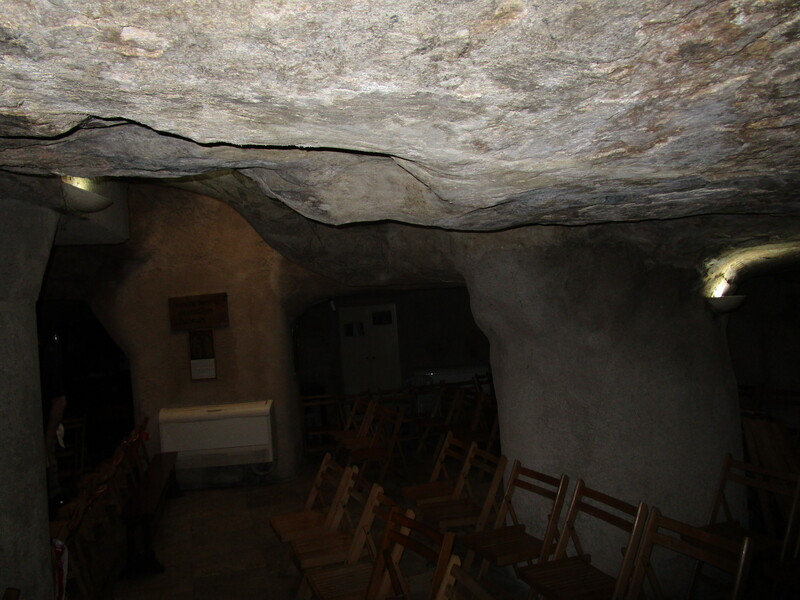 It was a very quiet underground cave tended by stern Franciscan monks. Of course we don’t know if these places are the exact location from the first century, but we know that they are close. 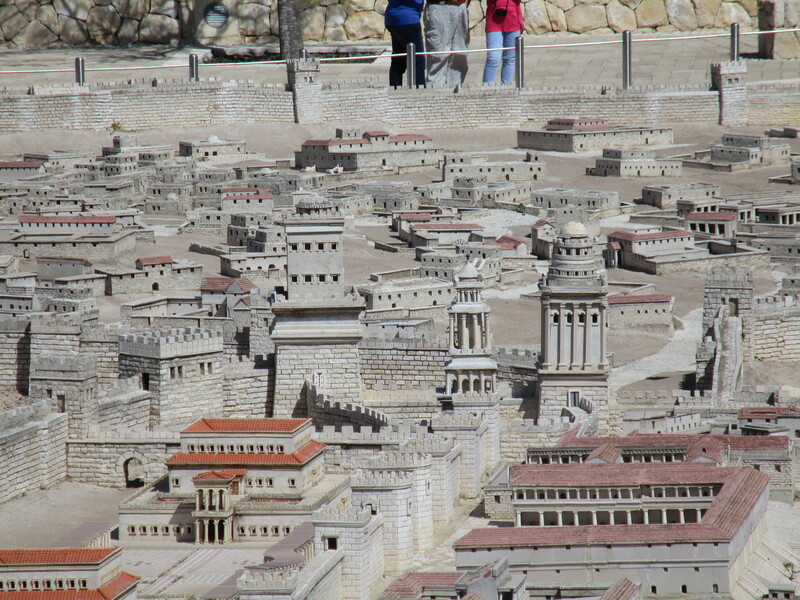 We got back in the bus and drove over to the Israel Museum, where there is a scale model of first century Jerusalem. 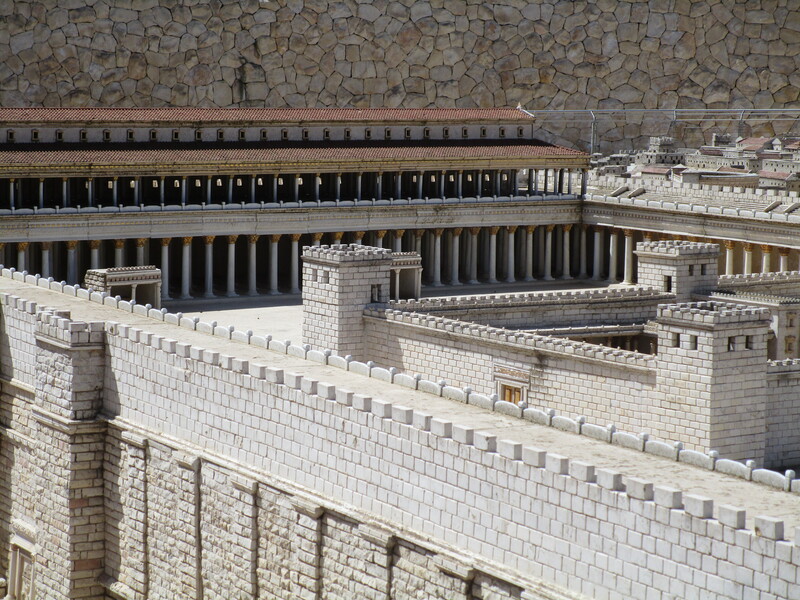 I’ve noticed that many people here will say “second temple period” when referring to the first century during Jesus’ time, meaning the Herodian temple rather than Solomon’s temple. This scale model is a marvel to behold: it covers an area about 30 yards wide and 40 yards long. 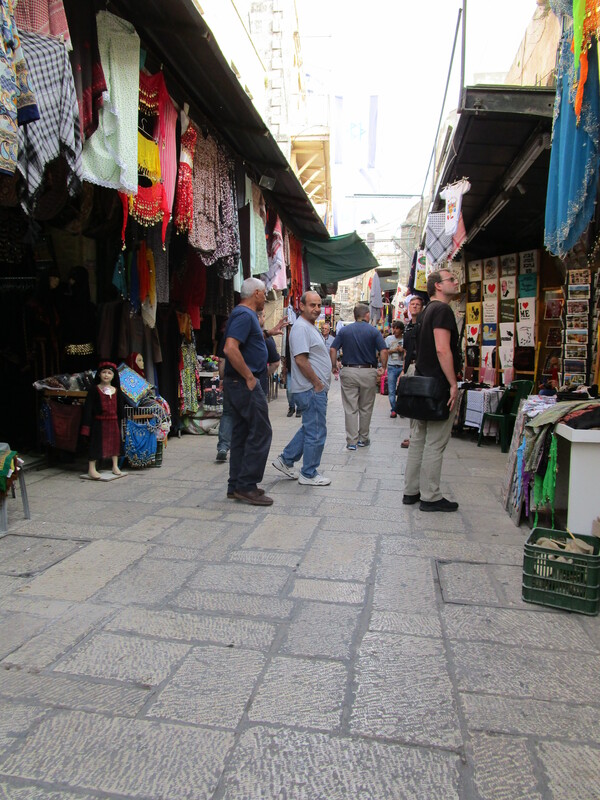 Very detailed and directionally oriented just like the city of Jerusalem. 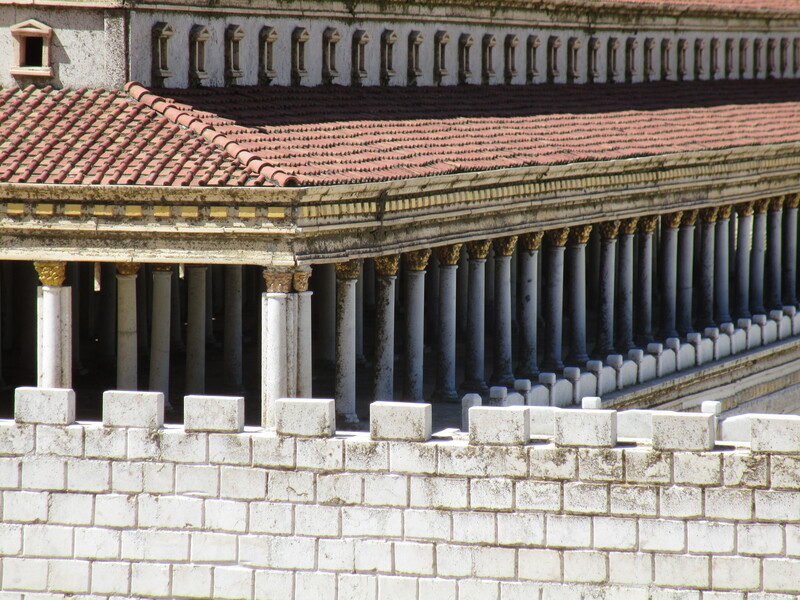 The vast temple is the focal point, as well as the Antonia Fortress. 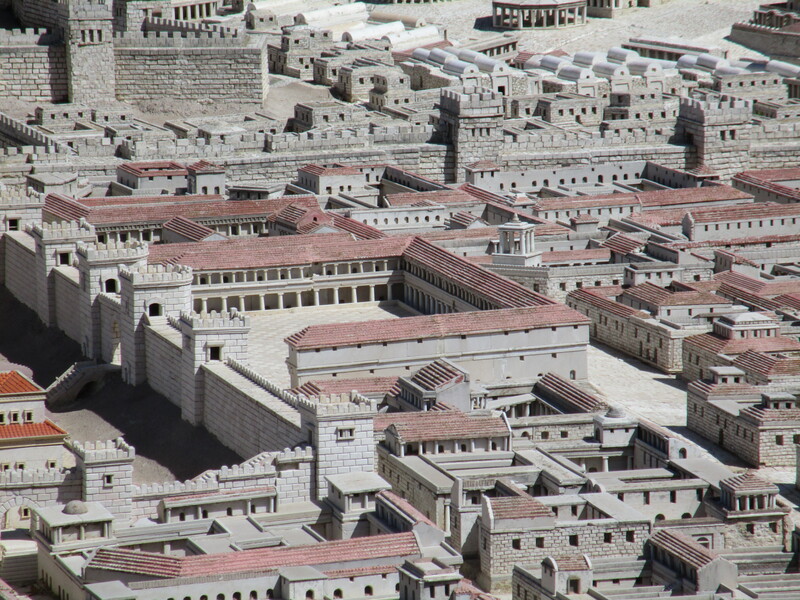 The palace of Caiaphas is represented, and it also gives a very good indication of the lower city housing lower-income people as opposed to the much larger homes with wider streets in the higher-income neighborhoods. 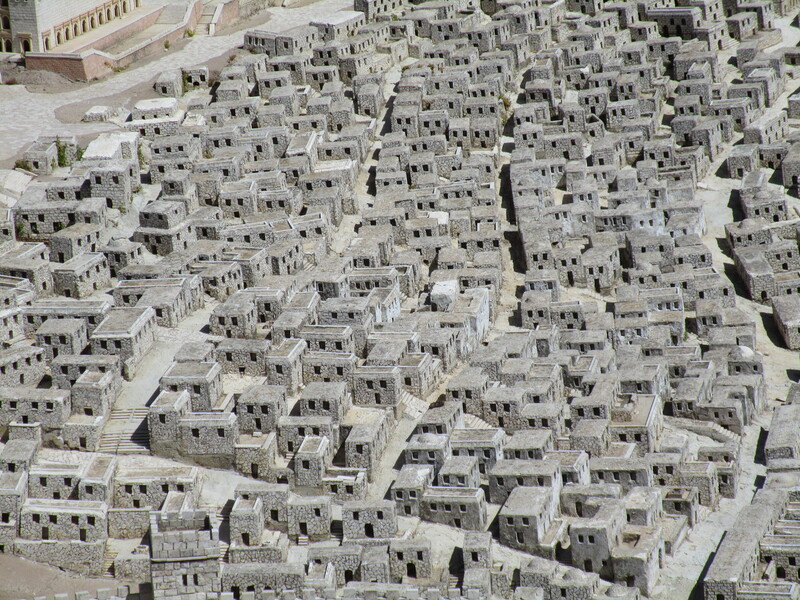 “Poorer” housing district, as opposed to the red-roofed area where more wealthy people lived. 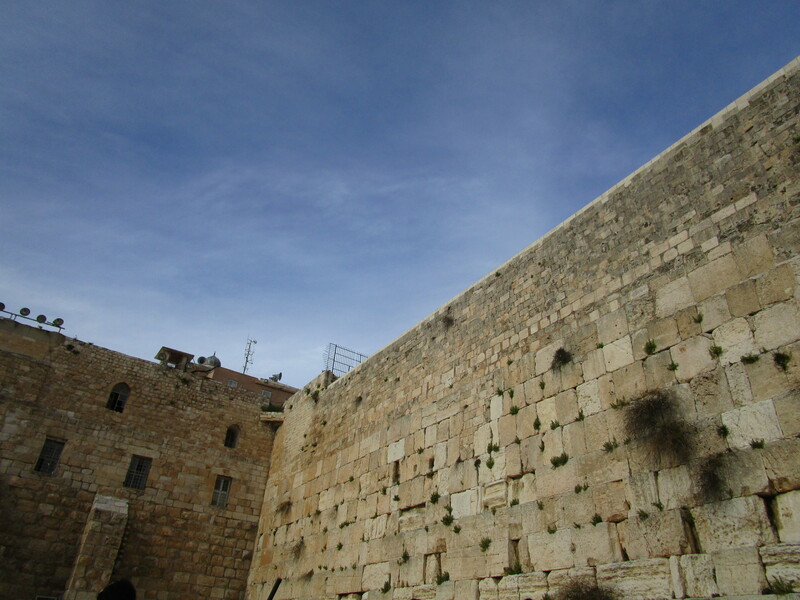 Josephus said: “the king had a palace inwardly thereto adjoined, which exceeds all my ability to describe it; for it was so very curious as to want no cost nor skill in its construction, but was entirely walled about to the height of thirty cubits, and was adorned with towers at equal distances, and with large bed-chambers, that would contain beds for a hundred guests a-piece, in which the variety of the stones is not to be expressed; for a large quantity of those that were rare of that kind was collected together.” His whole description is fascinating, and you can find it here. Some of our photographers MAY have climbed up on barrier to take photos, and they also MAY have been rebuked by the palace – I mean, museum, guards. After a solid two hours of photography, with John, Rick, Jon, Gary and Dewayne pointing out which part of the model they were most interested in Doug capturing, and Mat videoing, we moved on to the Shrine of the Book. 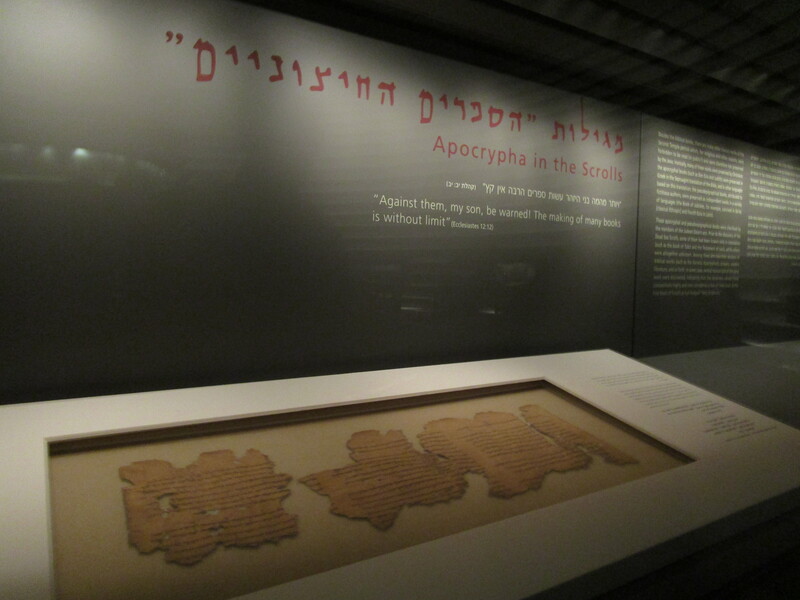 Here is where some of the Dead Sea Scrolls are displayed. 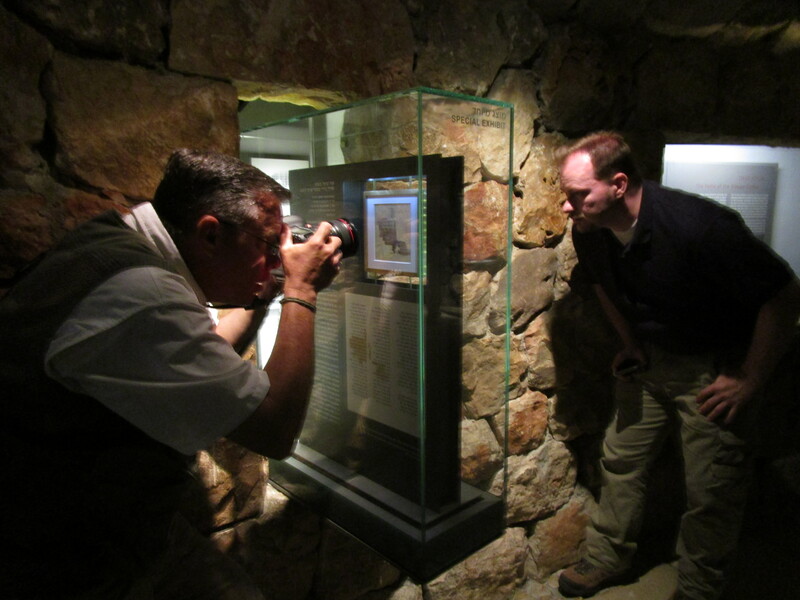 We had received permission to take non-flash photographs inside (because they normally don’t allow any type of photography) and so we feel very privileged to have footage of the Dead Sea Scrolls and Aleppo Codex! The Dead Sea Scrolls are particularly important because they contained representations of all of the Old Testament books except for Esther, and the most complete book of Isaiah yet found. Almost all scholars agree that they date back long prior to the birth of Christ, which is significant because He fulfilled all of the prophecies in documents that were written before He was even born. 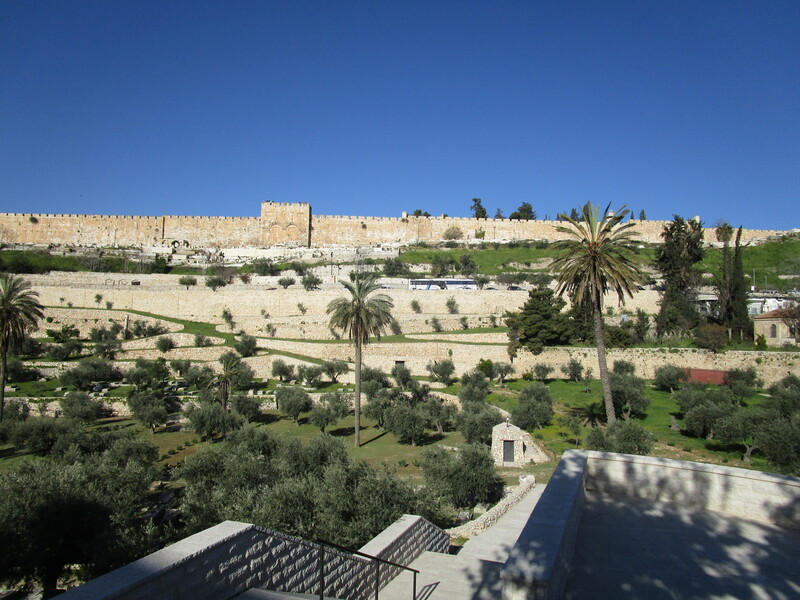 We had a quick lunch there at the museum and then headed to the old city of Jerusalem. 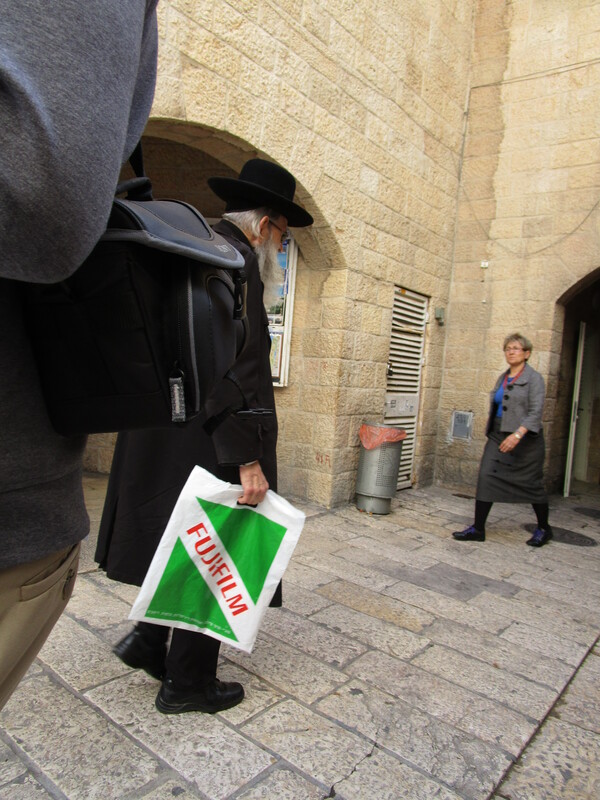 Yossi dropped us off amid other busloads of people with the cars behind us angrily honking. Hordes of people were everywhere, including several older women from Tennessee who were excited to see Dewayne’s big orange “T” on his hat. 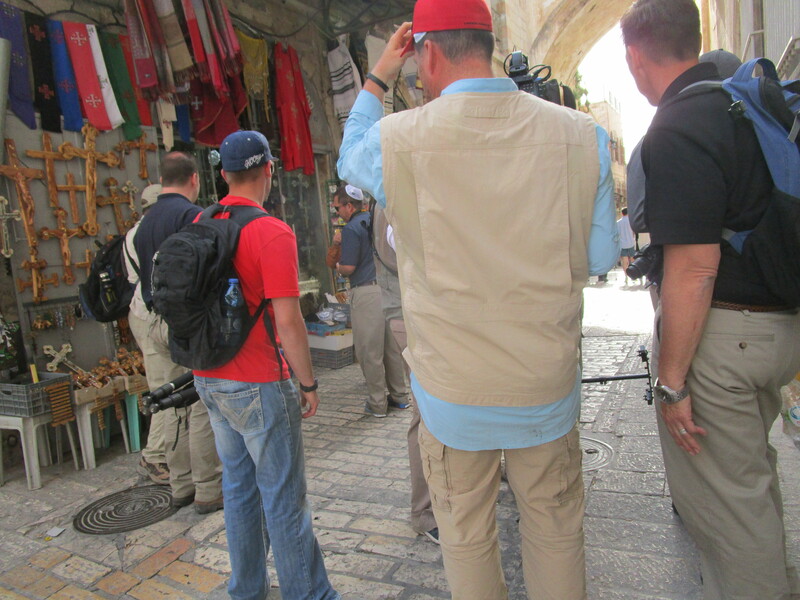 We followed Tsvi through the Zion Gate into the Armenian quarter, turned a few corners and then he said we were in the Jewish quarter. 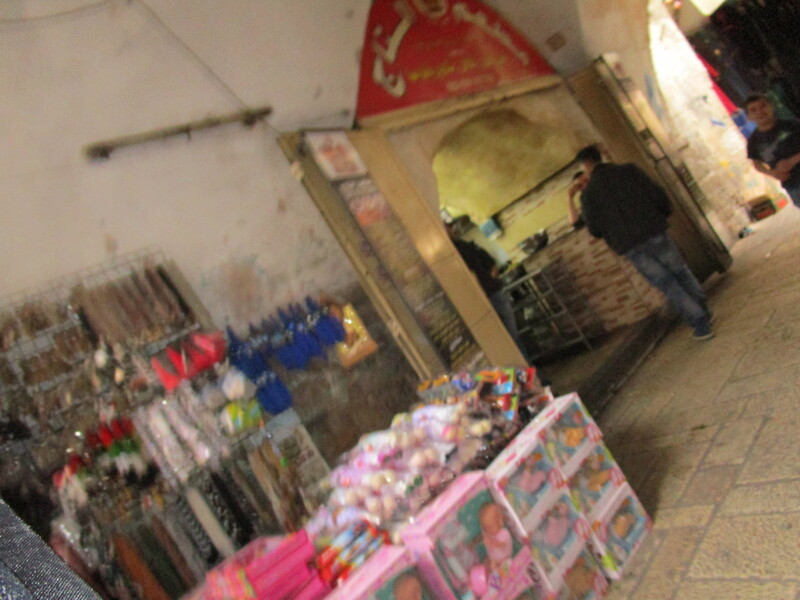 We saw shops of all kinds, narrow alleyway shops with fresh bread and pizza (without meat) displayed in the doorway. The streets were paved with stones. 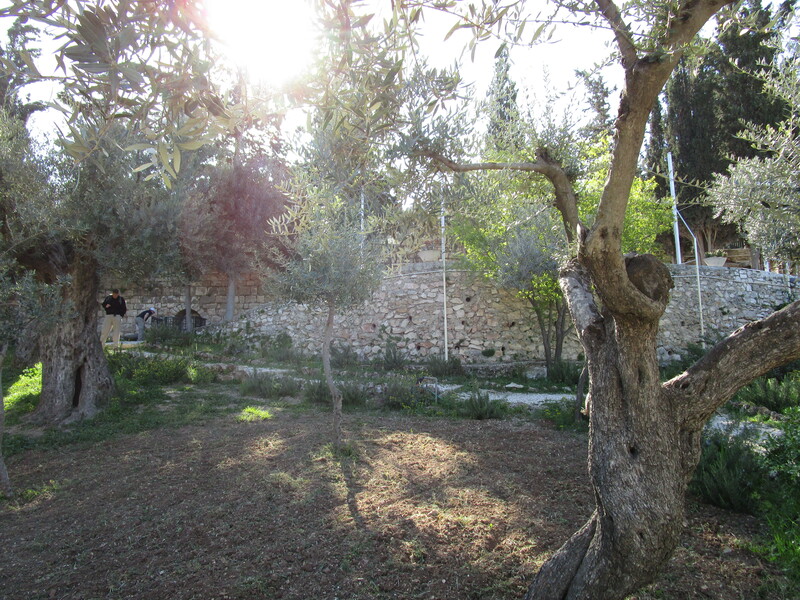 Little boys with yarmulkes slapped onto the back of their heads were trailing after their Rabbi leading them to the playground: a slide and monkey bars on a little patch of green in the middle of stone walls. 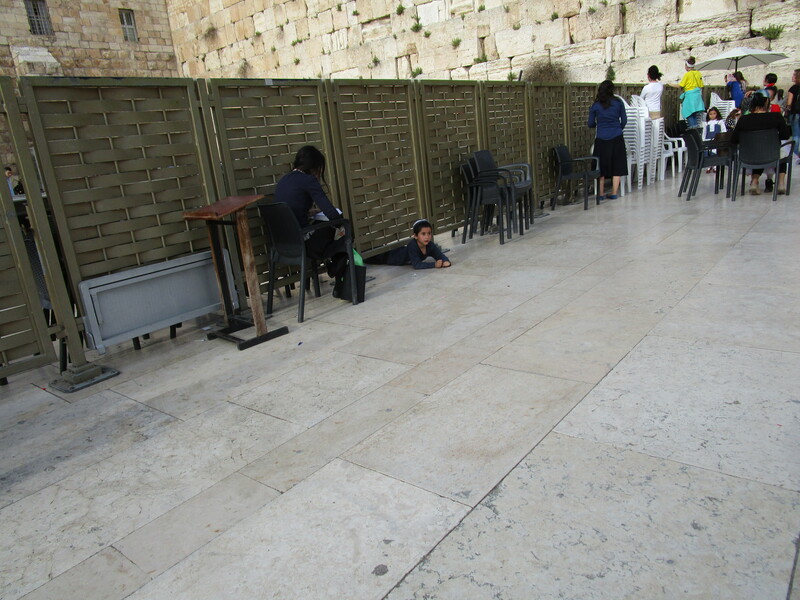 We had a two o’clock appointment to be taken through the tunnels beneath the Western Wall. 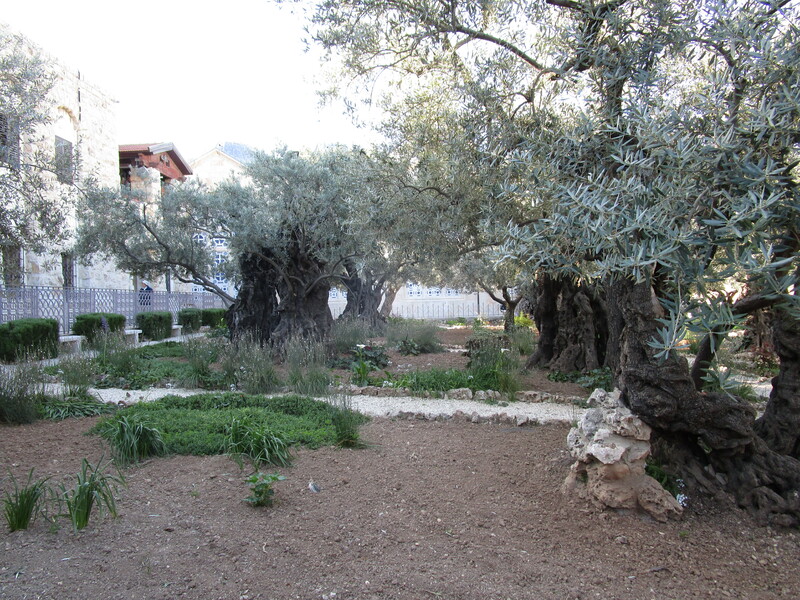 We were met by a man with a very definite Jersey accent, whose name was Hanoch (in English we would say Enoch.) He was a nice man, who said he was born, raised and educated in New York City, but became a citizen of Israel in 2009 (and by the way, his MBA was in health care administration from New York University, and he said “I can’t figure out your Obamacare health care system!” Join the club, Hanoch.) Dewayne had some segments to film here, both A-roll and B-roll. 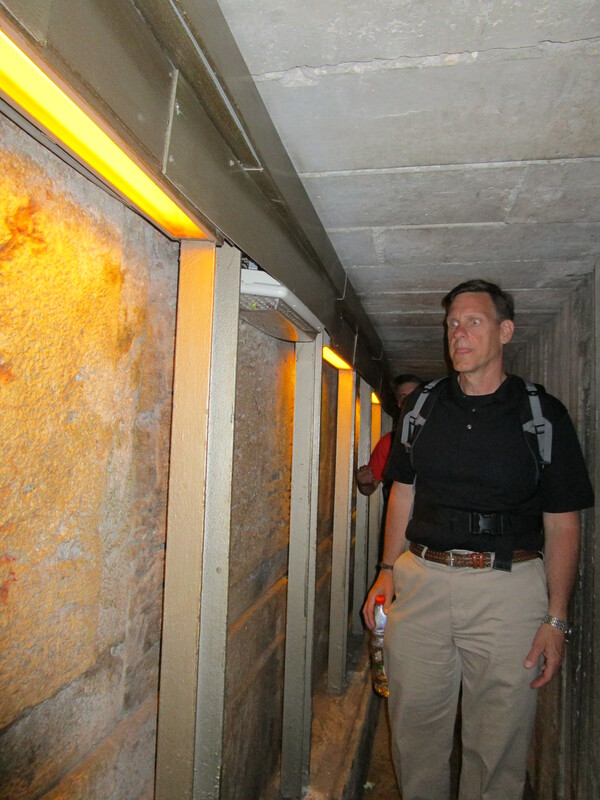 The tunnels were very interesting, taking us directly below the old city and western wall. It was a little bit unnerving to think how we might be trapped if a wall collapsed, but we also got to see the largest building stone in any manmade building, including the Egyptian pyramids. It is 13 ½ meters wide, 10 ½ meters high, and 4 ½ meters thick, carved out of limestone. Hanoch showed us a little film demonstrating how early Jerusalem must have quarried and moved these huge stones into place. 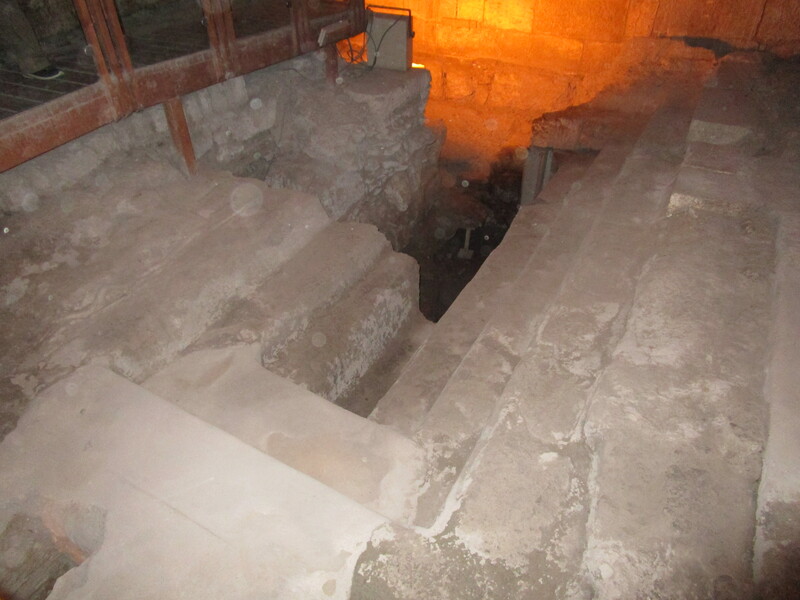 We saw ancient mikvehs used for baptism and ritual cleansing in the temple. It was interesting! 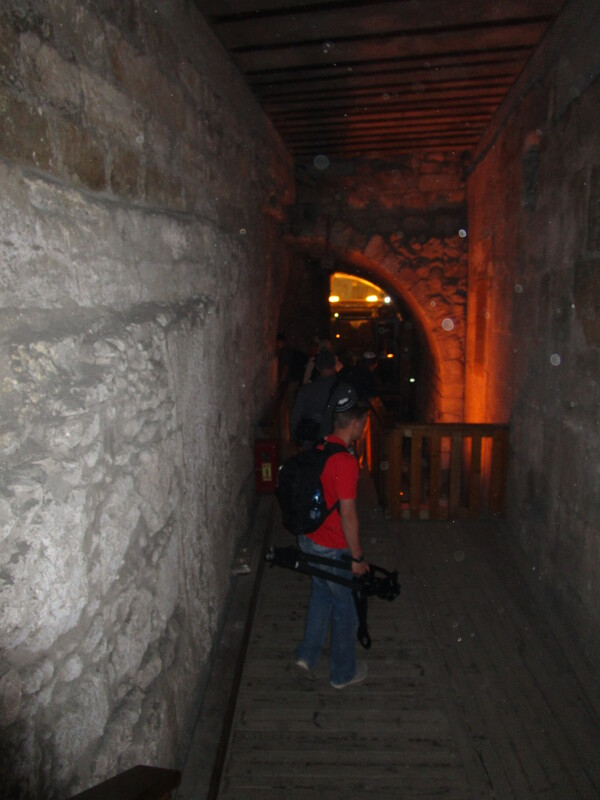 When we emerged from the tunnels we found ourselves in the Muslim quarter. 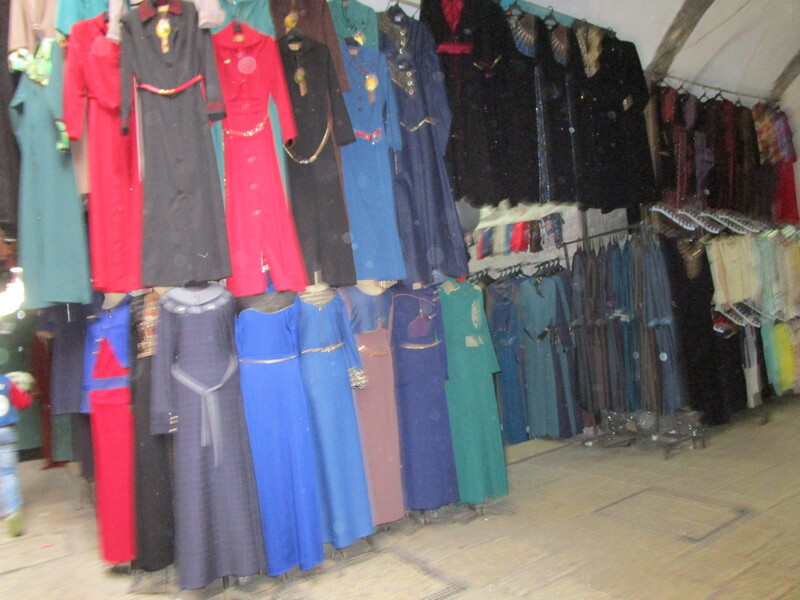 On our way back to the Jewish quarter we walked through tight streets (occasionally a car went by, and I have no idea what they would have done if someone came the other direction) with shop after shop filled with women’s traditional Muslim garb (including athletic bras hanging from the front door,) toy trinkets, Jerusalem pottery, cheap souvenirs, and hot, fresh bread and pretzels. I tried to take photos surreptitiously – but they just turned out blurry. 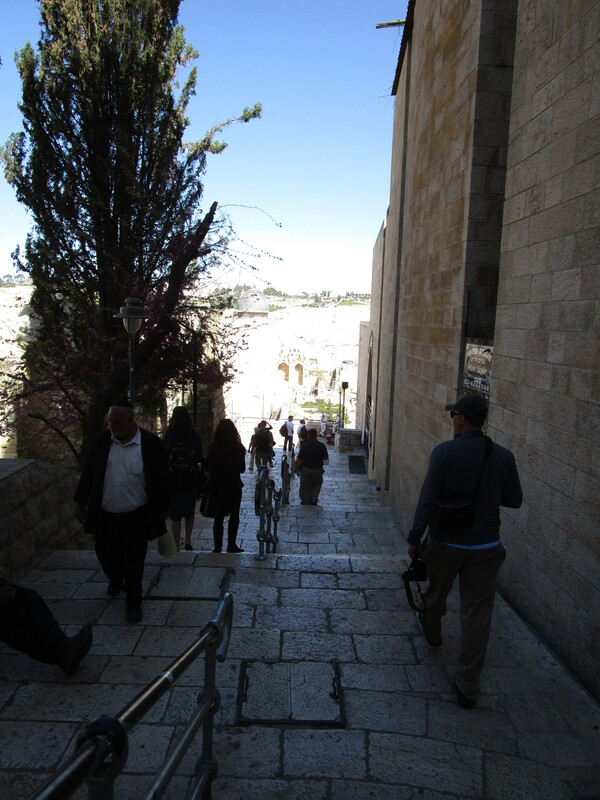 Here again, we saw monks, robed Arabic women, and Jewish men all walking and “living” (semi) peacefully side by side. 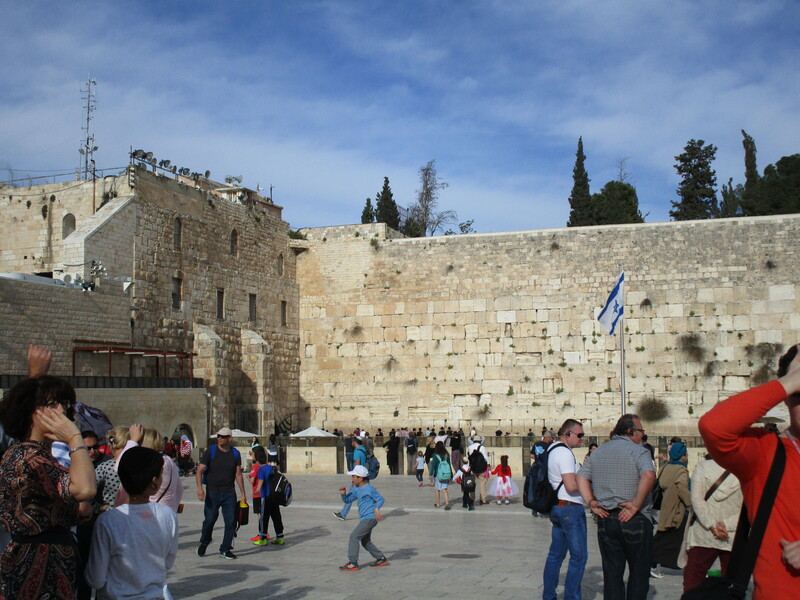 It seems like the middle east could take lessons from Jerusalem in living in peace – but I understand that it’s far more complicated than that. 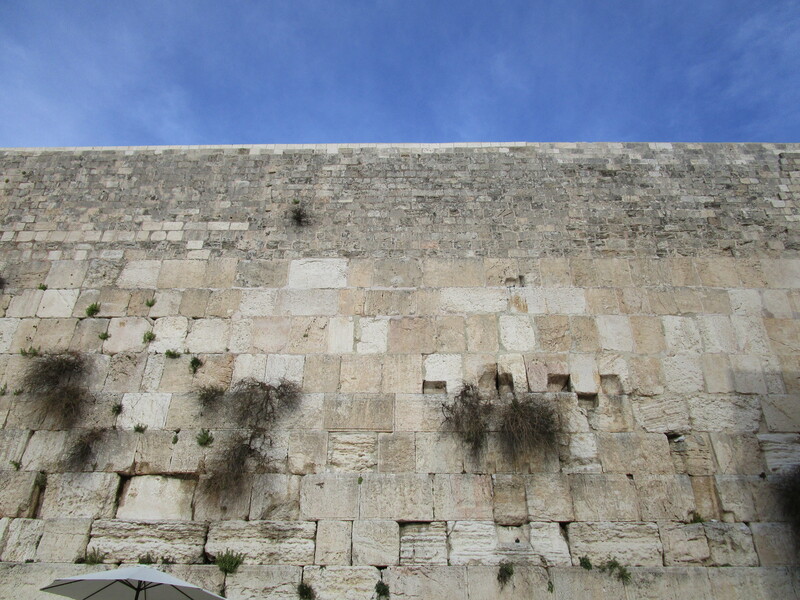 Our last stop was the Western Wall – no doubt you have all seen pictures. Dewayne filmed here with Mat, and the rest of us did a little exploring in the immediate area. I walked alone down to the women’s area. It was about half the size of a football field. Only about half of the women’s heads were covered – I had brought and worn a scarf around my neck just in case I needed it there, but it wasn’t required. I saw a man pass a baby girl over the partition (dividing the men’s and women’s sections) into her mother’s arms. Little boys were climbing back and forth under the partition. 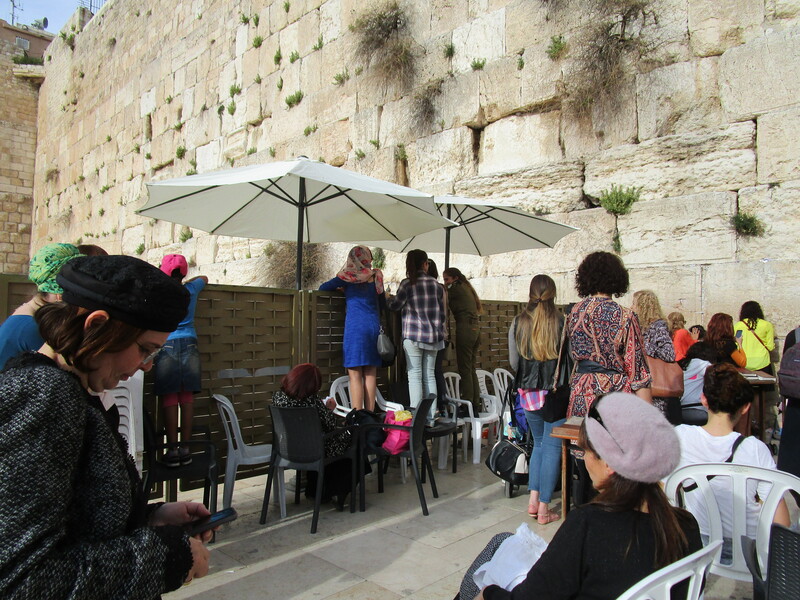 Several women were standing in chairs looking over the partition where evidently a little boy was having his bar mitzvah. I could hear chanting and singing, and then all of a sudden a boy’s head popped up on the men’s side of the partition, and his mother and sisters, standing on the women’s side, hugged and kissed him and proudly cried. 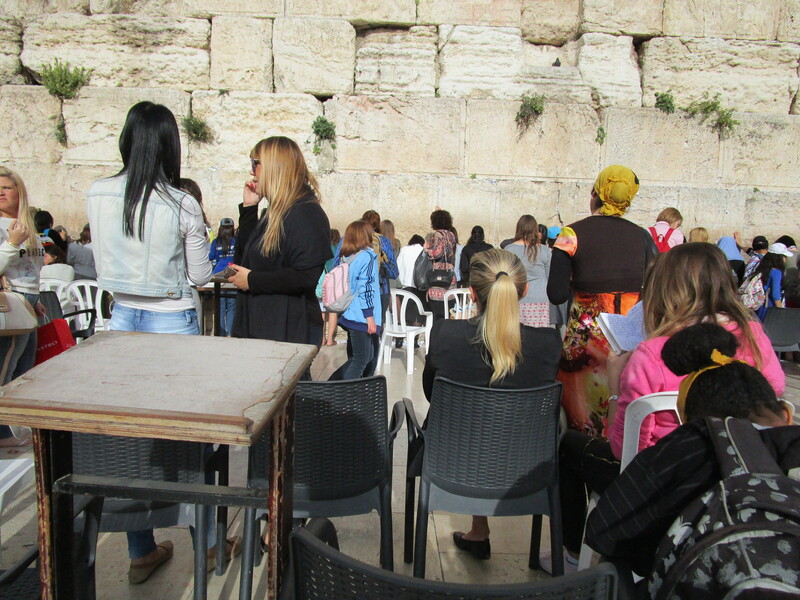 I saw women of all colors, shapes and sizes with their foreheads and palms pressed against the stones of the Western wall, praying and crying. 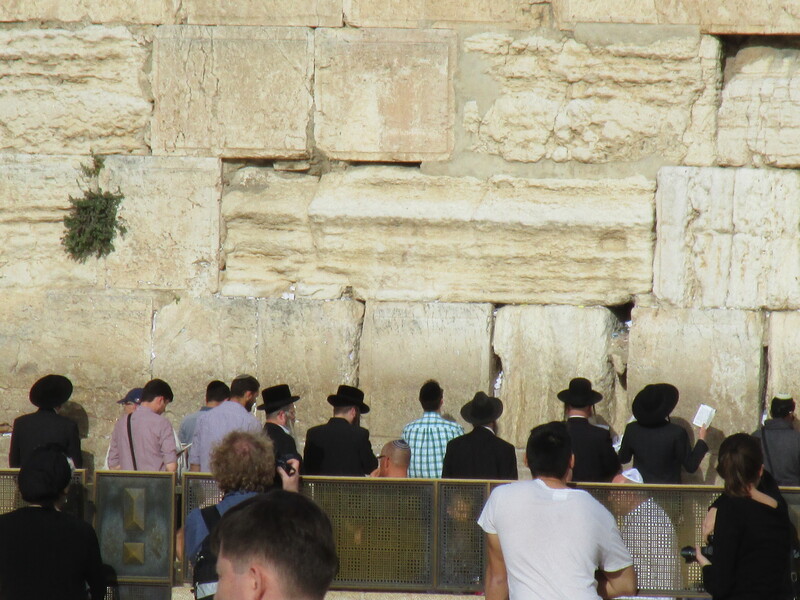 Some were standing away from the wall holding a book (the Torah?) in front of their eyes. One woman was even fixing her makeup and then took a selfie in front of the wall. I moved closer and could see pigeons perched high above in the little natural niches above the women’s heads. Small bushes were growing between cracks in the wall. 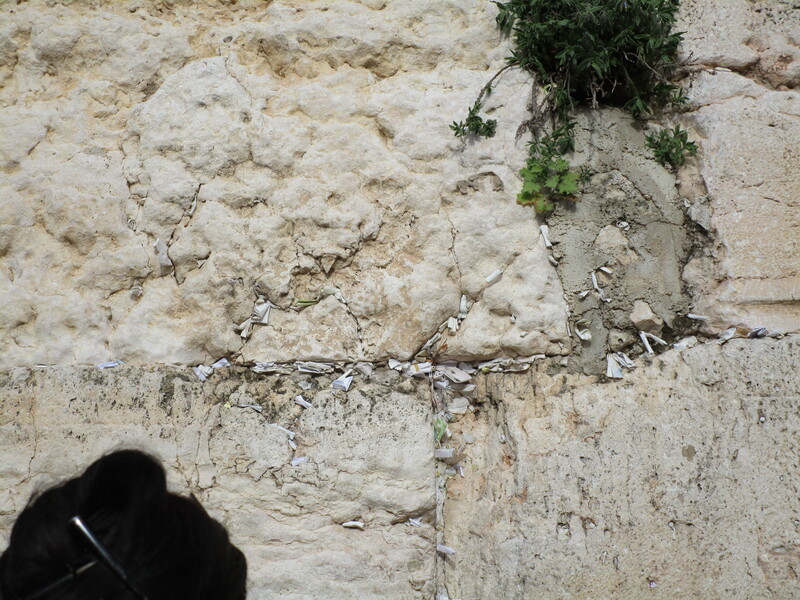 And thousands upon thousands of folded paper notes were crammed and tucked into every reachable crevice in the wall: prayer notes left by women wanting God to answer their prayers. When I came back, Tsvi asked if I had left a prayer note in the wall. When I replied that I hadn’t, he asked the reason. And again, I was reminded how thankful I am that God hears my prayers whether I am in Jerusalem, or Dripping Springs, TX, or anywhere in between. 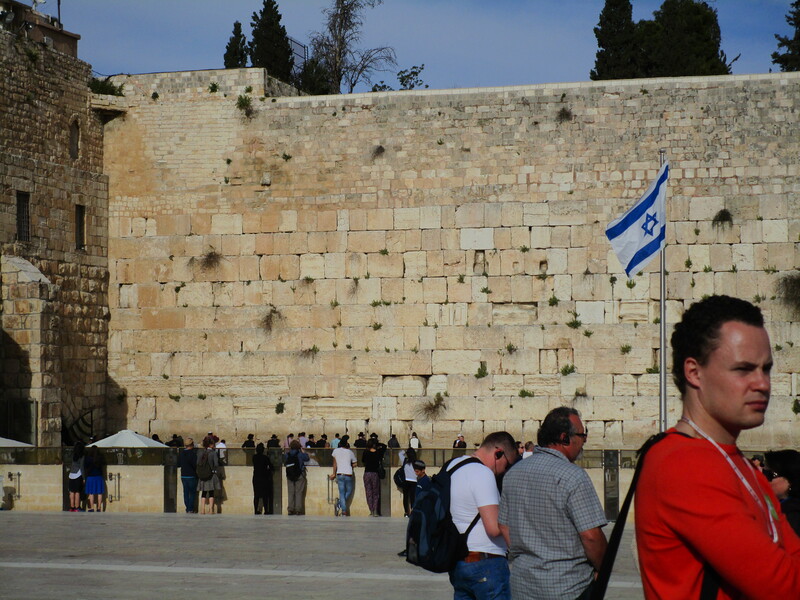 Tsvi went to see his mother (who lives in Jerusalem) last night. When I asked him how the visit went, he said “ohh, she was glad for the veesit! But Passover – ees a disease of cleaning!” Passover is coming soon, and Jews thoroughly clean their homes beforehand. I need to do the same thing! And finally, Micah informed me that “there is no scientific name for ‘booger’. ‘Dried nasal mucus’ is the closest thing. However, rhinotillexomania is compulsive nose-picking.” We are so dignified. 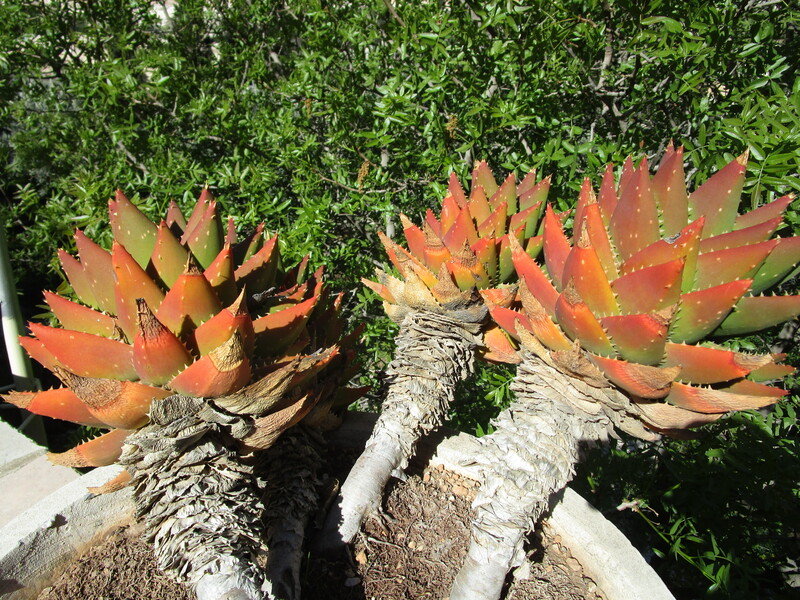 Previous Let Me Tell You About Three Tels! 🙂 Boys will be boys. I worship where Gary preaches. So glad to be able to experience vicariously your wonderful journey. Thank you for being such a good journalist.